Most movies aim to give us resolution, the so-called “Hollywood ending.” And we’ll take it because life is so often hard, and movies comfort. So why would I spend 10 hours in a theater watching a series of 10 hour-long subtitled movies that deliberately withhold closure, set up dilemmas and leave us suspended indefinitely? On one level, it’s because my best film experiences have come along a journey in cultivating a capacity for ambiguity, growing beyond my impatience for quick meaning and neat solutions. Secondly, the “Dekalog” offers no philosophical abstract “Thou Shalt Nots,” but rather astonishingly-realized narrative and visual gems by one of the most-acclaimed and influential filmmakers of the last half-century, Krzysztof Kieslowski. As for that day, it was chance to revisit cinematic near-perfection with films I screen for newbies who respond, “I had no idea a film could do that!” I believed that a single-sitting viewing would reveal connections between films and an overarching vision. Then there was pure film-nerd glory – finishing a marathon of watching the classic series. I didn’t see “Dekalog” (1988) on its earliest theatrical run, but I kept hearing about this Polish made-for-TV series based on the Ten Commandments, though not in any simple one-to-one way, and with mind-blowing production values and moral depth. My growing sense that this might be something for the church and not just the art house was proven sound when I finally tracked down the films on VHS and screened them, first alone and then repeatedly over the years with friends. This isn’t the first time I’d watched a Kieslowski film series in one sitting, however. I had also been mesmerized by the other critically-acclaimed series, the “Three Colors” trilogy, about the post-Communist rebirth of Europe. Through five hours, those films open in layer upon layer of meaning, both as individual works based on the colors/values of the French flag/revolution and as a unified whole. Kieslowski died in 1996 at age 54, leaving a compact body of work that tops many a “Best of” film lists. He began as a documentary-maker in Poland under the Communist regime as it was unravelling. Kieslowski was researching political trials when he met a Solidarity lawyer, Krzysztof Piesiewicz, with whom he co-wrote his most famous films, including “Dekalog” and other films. They also teamed with composer Zbigniew Preisner so that the films include a unique weaving of music into the films. The figure appears in the stories at key moments, typically when characters face an ethical fork in the road. He serves as a witness to the choices they make, though we are never sure whether they are made of their own free will or fate. In any case, the choices are never easy nor often entirely satisfying. Some things don’t add up, get resolved, or find closure. Indeed, the strategy is to disturb our certainties, show us how quick we are to judge, how we not only miss key factors in our moral judgments but how we tend to use others as markers in calculations rigged to secure our own moral standing. The power of “Dekalog” emerges from maddeningly complex human settings, each episode a richly-realized world with backstory, extenuating circumstances, and human consequences on the line. The director leaves gaps – including some that can’t be filled. We have to not just try and see in the dark, but to make judgments amidst daunting ambiguity. We get flashes of some ideal moral clarity but it never comes into complete focus since we remain, alas, Flatlanders straining to imagine fuller dimensions. What is goodness? Freedom? Law? Taboo? What are the moral limits of action? Who decides? What if law and morality conflict? Letter and spirit? Different moral values in the same situation? Can lying or stealing ever be the right thing? Is it okay, for example, to abandon one’s family to save one’s ex-mistress? What do we owe one another – parents, children, strangers? The larger arc is from our self-satisfied ethical calculations to something beyond – to moral engagement with real persons, something akin to love. 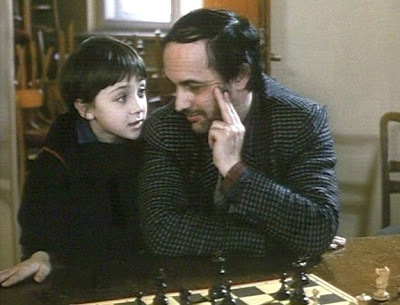 Kieslowski’s opener – still my favorite – offers a meditation on science, religion, art and mystery. Here is a most significant place to begin a series on morality – highlighting that mysterious crossover between ethics and aesthetics. Part of me wants to congratulate myself for finishing all 10 in one sitting, made possible in to small way by energy drinks and stretches during the breaks. By “Dekalog 10”, I was wired enough to think I could have done “Dekalog 11” or “Dekalog 12.” That may have been the Mountain Dew talking. I kept feeling like I should to be able to reduce my marathon experience to some humble-but-insightful nugget, like “Blessed rather are those who keep the commandments.” But Dekalog’s transcendent figure appeared and shook his head, sadly, wondering which moral I’d choose in a moment of real-life dilemma. If my take-away could just be a sense that he was always around, ready to warn me “Be careful. This is significant.” Or if I could remember there’s always more to anybody’s situation than I know.